Tribute to the three Raj brothers G D Paulraj, G D Arulraj and G D Thyagaraj and some of my experiences when I lived in India. 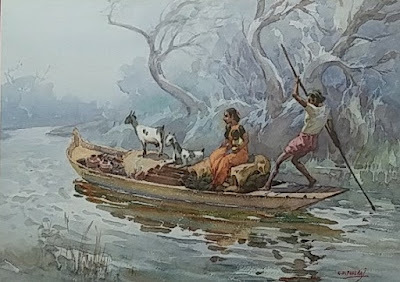 This is a fairly unusual painting by Paulraj showing a family on a boat being punted by use of a long pole down a stream or canal. The father is working the boat while the mother is taking care of a small child and two goats are roaming the deck. Quite a fun composition. I do not remember seeing a Paulraj goat before.